Istanbul is one of the most beautiful ancient cities in Turkey. It is full of classic architectures and is one of the most amazing places to visit. Moreover, it has a very rich culture and shares great historical significance because of its unique location on the world map. Although, you can visit this wonderful city on any conveyance, but if you really want to make your tour memorable, you should take a walking tour. There are certain things, mentioned in the given steps, which you need to keep in mind while planning your walking tour of Istanbul. First of all, you must prepare yourself mentally for taking a walking tour. You must know that you will have to take a long walk which is often not easy for everyone. Moreover, preparing your mind only is not enough, you should also be physically fit for walking. In addition, you should know that although the weather mostly remains mild in Istanbul, but sometimes it becomes really drastic. Therefore, you must carry some beverages so as to avoid any kind of dehydration during your journey. Furthermore, you have to wear light clothes and comfortable shoes. It is extremely important for you to get map of the city in order to save time in finding the required directions for your destinations. You can easily find the map from Istanbul Convention and Visitors Bureau. Besides, you can also download it from the internet which is even more convenient. In contrast, if you have not been able to get a map, you can simply follow the signs made on the streets to reach at your desired destination. It will be better for you to take a start from the Milion which is in the downtown Istanbul. It was marked as the centre of Istanbul in the ancient times when the name of city used to be Constantinople. Then, you should walk along Divan Yolu, a street which takes you toward the restaurants and shops. On your way, you will see many landmarks which will include famous tombs of the sultans from different eras, forums, schools, monuments and mosques. 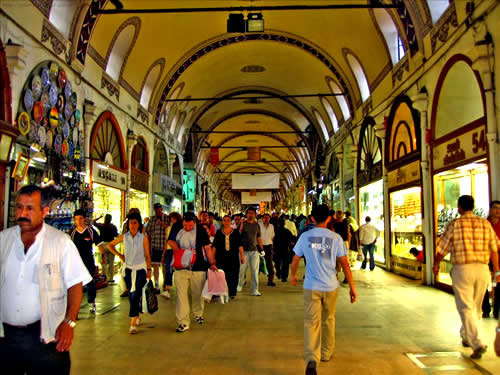 After a while, you will reach at the Grand Bazaar which is a big market and has around 5000 shops. You can find almost everything in the market. It is the end of your journey after which you can eat food at any restaurant or you can go back to your hotel.